Printed colors that extend past the edge of a page. To cut the job to its actual size, the processor has to make sure the job gets printed with 1/8 of an inch bleed. Some jobs may require more than that. Paper coated on both sides. Our 14pt and 16pt paper are examples of C2S. Also called cover stock. Mostly heavyweight papers are called cards stock. 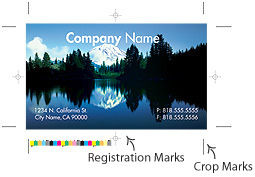 The thickness of card stock is indicated with point sizes such as 14pt, 16pt. 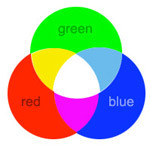 The primary colors used in 4-color printing. CMYK are used to reproduce full color on the printed sheet. CMYK also called PROCESS COLOR. The mixture of clay materials that are applied to paper to improve the smoothness of the paper's surface and improve ink holdout during the printing process. Examples are Aqueous coating (AQ) and UV coating. UV coating adds a gloss finish to the product and also improves the vibrancy of the printed color. Spot-UV can be applied to selected portions of the piece, while keeping the rest matte finish. A specific shape like circle, star, etc. (any designs that cannot be done by a straight cut) which is cut by a metal blade. 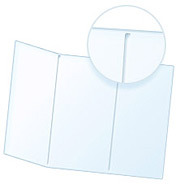 Door hangers are a popular product which requires die cutting. Double Gate Fold: Single gate fold, with an additional fold on the center. Z Fold: A paper fold represented by back and forth folds into three panels. Printing on the front and back of a sheet so that the tops of each side are printed at opposite ends from each other. The top of one side is opposite the bottom of the other. You would turn the sheet over from top to bottom to read the reverse side. Also referred to as "head-to-tail" or "tumble". A matte film offering low glare surface to facilitate electronic scanning and excellent acid, chemical and oil resistance. The process of setting up and adjusting a printing press for a particular ink, paper and specifications prior to printing. This includes adjusting the infeed, grippers and guides, adjusting ink for proper coverage, registering copy and matching the printed piece with the proof to be sure everything is correct. Also referred as Make-Ready. The paper used while making all the necessary adjustments before printing the actual run. A coated paper finish that is flat, not shiny like a gloss, but still keeps much of the ink from being absorbed by the paper and produces an excellent image. Matte/Dull finish is applied to all 14pt jobs and 16pt jobs unless it is Spot UV. 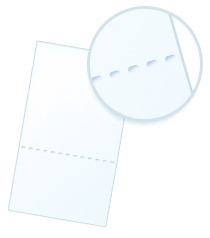 Creating a series of holes so that the paper can be torn more easily along the line is formed. The smallest unit of a digitized image created by a digital device, such as a computer, camera or scanner. Pixel is short for "picture element". The more pixels per inch the better the resolution. On computer monitors, the display is divided into rows and columns containing thousands or millions of pixels. Each pixel is composed of three dots representing the three color channels of red, green, and blue light that are necessary for creating a color image on computer monitors and television screens. 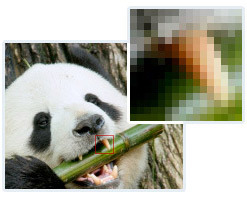 Because of their small size, the pixels appear to merge, simulating a continuous tone image, but when magnified they appear to be tiny square blocks of light, as shown in the illustration. We offer different kinds of presentation folders with 1 or 2, left and right pockets, business card slit, left or right is optional. Checking a proof for errors or discrepancies fro the original copy. A price given, based on the specifications supplied for that product. We are more than happy to give you a price quote for any custom job that is not listed in our website. The measurement of output quality expressed in pixels per inch on a computer monitor or dots per inch on printed media. When referring to printed media, a 300 dpi (dots per inch) printer, is capable of outputting 300 dots in a one-inch line, which means that it has the ability of printing 90,000 distinct dots per square inch (300 x 300). The additive primary colors, red, green and blue, used to display color in video monitors. Printing with a file in RGB color mode will produce a washed out appearance. We do not check files for RGB. The responsibility falls to the customer before submission of the files. 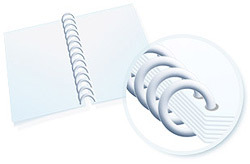 Book binding that consists of a spiral wire or plastic that is wound through holes. Also referred to as "coil binding. Coating paper only in specific areas as opposed to all over coating. In a Spot UV job the job gets a UV coating in only specific areas and does not get any AQ coating in any other places. 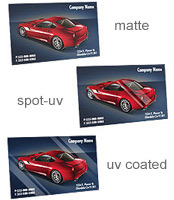 Spot UV can be referred to as "spot varnish". A liquid coating applied to the printed piece, which is then bonded and cured with ultraviolet light. This coating is used to provide a protective coating to the printed image. Please note that you CAN NOT write or imprint on UV coated jobs.